Friday August 31, 2018 - Deputy Chief Justice Philomena Mwilu is cruel, amorous and an adulterous woman who cannot keep her pants on when she sees a good looking man. This was revealed by her ex-husband, Zack Maluki, who divorced her in 2015 after almost 2 decades of marriage with 2 children because he could not take Mwilu’s randy behaviours any longer. 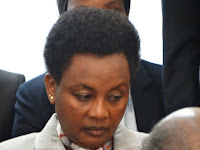 According to Maluki, Mwilu cheated on him with several men, among them a former MP in Makueni and the current Busia Senator Amos Wako, while they were still living together. Besides, he describes Mwilu as a woman of attitude who harbours too much anger that would literally kill anyone. Maluki accused Mwilu of mistreating his parents to the point of causing him distress and disgrace among his relatives. He cited infidelity and cruelty on the part of Mwilu as the two reasons that forced him to file for divorce. “I accept the evidence and find that the respondent (Mwilu) was guilty of cruelty and adultery,” High Court Judge Aggrey Muchelule ruled. Any woman who is not drilled properly and regularly,would be cruel. waah.. si wanipee haka nigonge kigongi mpaka ipige binja!! !